Cook chopped okra in some salted water till soft and keep it aside. Grind grated coconut, cumin seeds, shallots and chilli powder into a coarse paste adding very little water. Heat oil in a pan, splutter mustard seeds and add curry leaves. Add ground paste and saute for a minute. Then add okra pieces and tamarind paste, mix well and cook covered for 2-3 minutes. 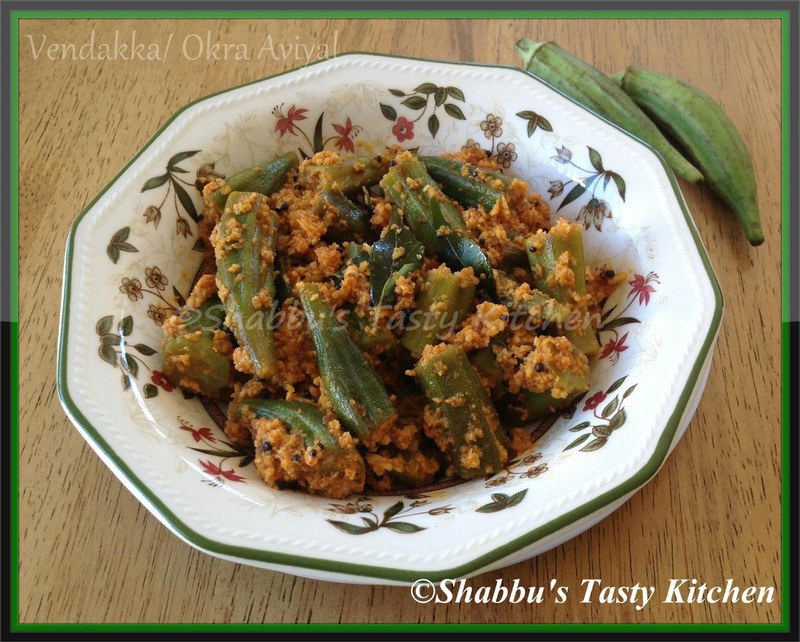 Adjust salt ..
Spicy okra fry is truely luscious. I never liked okra unless its thinly sliced and made into poriyal without the slimey stuffs but this aviyal is very tempting...will it be slimey too? wow - thats different, i never knew one such method. how about just filling the ground paste inside the finger's and simply toasting. have you ever tried that without tamarind? haven't tried aviyal before with kra..looks yummy! !